If you are showing signs of gum disease such as swollen gums, bad breath that won't go away, bleeding gums, or sensitive teeth, please contact us today for a consultation. One of the reasons that gum disease is so dangerous is that it sneaks up on people. At first, you might not notice anything more than bad breath and gums that bleed when you try to floss. Unfortunately, as gum disease progresses, it can cause inflamed gums, infections around your teeth, and eventually—tooth loss. If you suspect that you have gum disease, make an appointment with us today. We can evaluate your teeth, diagnose your symptoms, and start treatment immediately. Do your gums look like they are slowly receding away from your teeth? In addition to making your gum line look uneven, gum recession can also make your teeth sensitive to hot and cold foods. 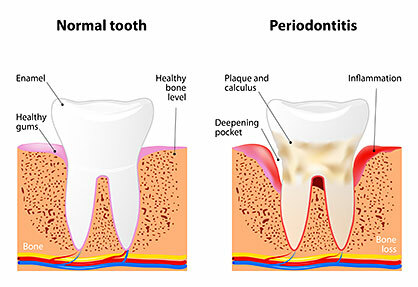 Gum recession can be caused by aggressive brushing, but it can also be caused by periodontal disease. Fortunately, here at Arizona Periodontal Group, we can treat the gum disease that caused the problem, and replace the missing tissue with new gum grafting techniques. Unfortunately, gum disease affects more than your teeth. Believe it or not, scientists have found links between gum disease and dangerous ailments like cancer, osteoporosis, respiratory disease, diabetes, and even heart disease. Fortunately, gum disease is incredibly treatable. Dr. Trujillo can treat infections with antibiotics, and use special dental instruments to remove deep pockets of plaque and tartar. If you have bone deterioration caused by gum disease, our doctors can even conduct bone grafts to strengthen your jaw. You wouldn’t let your family doctor do surgery for a brain tumor, so why would you hire a general dentist to do your gum grafting? Unlike regular family dentists, who are usually generalists, Periodontists receive an additional three years of formal training to learn more about the diagnosis and treatment of advanced oral diseases. Here at Arizona Periodontal Group, we have an incredible doctor, Dr. Ariel Trujillo. We are dedicated to providing the best dental care possible to each and every one of our patients. To provide the best care for our patients, our periodontists stay up on new and improved dental techniques. One procedure that we offer in our office is LANAP, or laser assisted new attachment procedure. When patients have gum disease, some parts of their soft tissues will overgrow, and some will recede away from the gum line. Gum disease can also eat away at bone, leaving the patient with a misshapen jaw. However, unlike traditional gum surgery, where dentists try to cut away and rearrange the gum tissue, LANAP removes diseased tissue and helps healthy tissue to regenerate. In addition to prompting the mouth to heal on its own, LANAP surgery is also more comfortable for patients, and requires less recovery time. Although the price of dental implants varies significantly from patient to patient, most dental implants cost between $2,400 and $3,000. Although this might seem expensive, dental implants do more for you than make your smile look complete. Believe it or not, without constant jaw bone stimulation, your jaw can melt away and change the shape of your face. However, dental implants provide bone stimulation, so that you can stay looking like yourself.